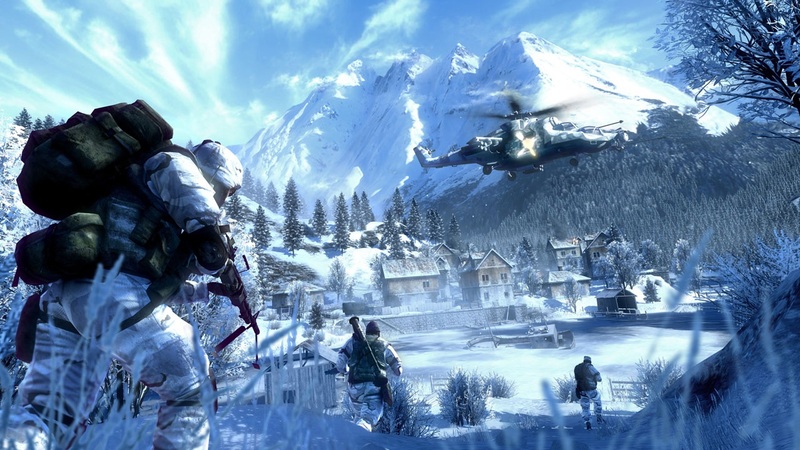 What connects the ‘Snowy Mountains’ Theme, the sound of the Yamino Buki and the opening logo from Battlefield Bad Company 2 (BFBC2)? Well, they all feature, to some degree a note or two of Dave Taylor’s bass trombone. It’s place in ‘Snowy Mountains’ is where it all started (around 26 seconds in). Stefan (Strandberg), the Audio Director of Bad Company 2 returned from the orchestral recording session in New York with Mikael (Karlsson) the composer, and one of the first things that he said to me, was that I had to hear the power of this bass trombone player, that literally scared the rest of the orchestra – and yes it was impressive and powerful – a fantastic raw, deep ripping blast. A few weeks past, and Stefan had to put in a placeholder sound for the Yamino Buki, a (fictitious) Japanese scalar weapon from World War 2, that was on a par with America’s atomic arsenal and Germany’s V2 rockets. When he asked me about it, to me it was obvious; just use the bass trombone note as the basis for it. A few more weeks past, and now the story for BFBC2 was nearing completion and all the occurrences and uses of the Yamino Buki in-game had been finalized. Now it would require the creation of a whole family of sounds, including distant & close charge up, distant & close activation, being damaged and destruction sounds. Stefan had taken the original bass trombone blast and applied a reverb to this (Waves Renaissance Verb – “The Church”) and this set the tone for the distant charge up sound. Or Brian Hodgson’s Dr. Who Tardis materialisation – the sound of a door key being scraped down piano wire. So I was in good company (I think). First off some distant ripping thunder added into the tail of each pulse added more movement and a large rolling feel to the sound. Also around this time I had just finished watching the final series of LOST (42 Secs In). So the addition of the wapiti elk was a small homage on my part and it sort of fits with the game’s opening chapter – a mysterious force on an island?? So once the distant sound had been created, now I needed to create the close up sound. This came about by “un-muddying” the distant version – what could create such a sound? I tackled this by firstly backing off the reverb and then by processing the original trombone sample more and more to bring it closer and larger, and ensuring that it remained aggressive and powerful. Layering many different lightly distorted versions of the original sample helped a lot to achieve this. Distortion came from using a variety of plugins including Lo-Air, Decapitator and Trash, and also from some Metasonix hardware. For the rest of the family of sounds, their creation followed a similar process. ProSoniq Morph was used to morph the original trombone blast sample with various animal vocals to use as additional elements. Then by using everything I had in the project, I found it quick to produce the Yamino Buki activation sounds, that completed the family of sounds. And that would have been the end of it – until the task for the game’s introduction logo came along. The logo movie shows; EA, DICE and then the Frostbite animated logos, which needed a bespoke sound across its entirety. Initially I looked hard at the visual and all the movement going on, as the inspiration for which sounds to look for, and then edited these to match the feel and temperature of the logo. After 4 hours I had got nowhere, and then it dawned on me, I still had a lot of material from the Yamino Buki session I could use. It also seemed like the perfect way to complete a trinity of sounds, that in their own way would be a ‘sonic thread’ throughout the game. To make it more challenging (actually more fun on my part), I decided that the logo sounds could only be made using the bass trombone blast and lots of editing and plugins. To give myself a larger pool of source material to use I ran the sample through a range of non-normal plugins, including, amongst others, the GRM Tools, SoundToys, Paul’s Extreme Sound Stretch and Crazy Ivan, and also chopped each of the lip smacks out from the sample to use as grains for the DICE part of the logo. When the Frostbite logo had been completed, the flow was very similar (identical?) to the original logo as used in Bad Company 1. So as a homage to the original work completed by Mari (Saastamoinen) and Kim (Creutzer), I recreated their sound for the logo, but again just using parts from my pool of processed trombone blasts. great initially source material, in the form of David’s bass trombone blast, that on its own already had a lot of the characteristics needed. a project that required a variety of big, unreal and mysterious sounds creating in line with a compelling fiction. and the time and space to think and experiment, and make mistakes, all as part of a very talented team. This entry was posted in Intervjuer, Länktips, Ljudeffekter, Teknik, Tips & trix, Videolänkar. Bookmark the permalink. Wow! Thank you for sharing your methods for design on this one. I am a huge fan, so excuse the bias but this was really informative. I love the process of sound design, and how many different influences you can bring to something like a simple logo sound. I hope more experts share their thoughts, it helps the whole community become stronger and brings more recognition to the under valued world of sound for games. Ben, this was a brilliant article. I’m really glad you posted it after so long! I’ve always been fascinated with the sound design process of games and films. You provided not only a great insight to the process in general but your own personal process of inspiration and tinkering. It’s exactly what I look for in a good behind the scenes/making-of feature. Very informative and interesting, amazing how much detail and work went into one very small aspect of the game. Amazing article! Great analysis! Thanks! I think the sound aspect of game design is often over looked when people talk about games and what they like about them. Most of the time it will be the graphics or how the engine handles the AI and layout, rarely do you hear people complimenting the use of sound which is rather sad. This is a great article and was very interesting seeing how simple sounds such as introductory/logo sounds come about. Thanks. wow, this was a great read. very informational. thank you. I think I’ve heard that same kind of sound on the jungle part of Jurassic Park 3.